The history of the PC has seen many different types of expansion slots. Some, like the MCA (Micro-Channel Architecture) interface, and the Video Electronics Standards Association's VESA interface, never really caught on and have quietly faded into history. Even newer interfaces such as the PCI and AGP interfaces have been replaced by the PCI-Express interfaces, which is now used for almost all expansion cards. The diagram in this picture is a bit dated, but in a way that's good because it also identifies some older interfaces such as the floppy drive and EIDE headers. 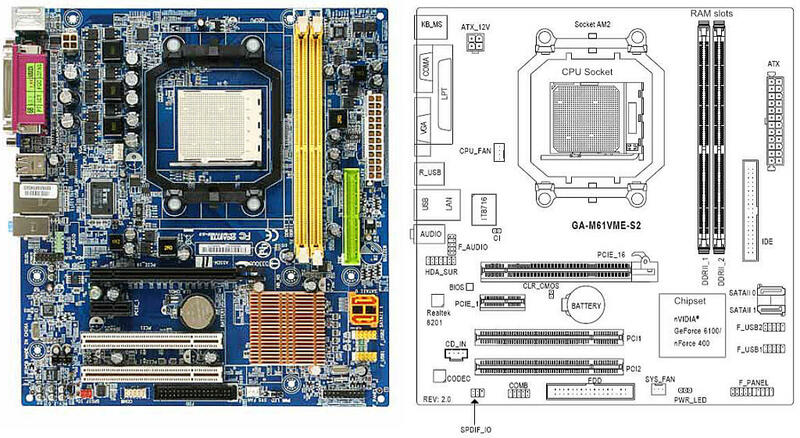 These won't be present on any new motherboard you buy, but they could still be helpful if you find yourself repairing or upgrading an older computer This is a picture of a Gigabyte GA-M61VME-S2, along with its diagram from the motherboard manual. This image should give you a pretty good idea of what the major components of a motherboard look like. Your motherboard's manual should also have a diagram help you find the components on your particular mobo, and you should read it before you even take the motherboard out of its box. At the time of this writing, the PCI Express slot is the most popular kind of expansion slot. It can be used for literally any kind of expansion card. At the time of this revision, there are four sizes of PCI-e slots called x1, x4, x8, and x16. Most video cards (especially gaming video cards) use x16. There are also three revisions (so far), which are backward-compatible (but not forward-compatible). So a PCI-e x16 version 2 card will perform just fine in a PCI-e x16 version 3 slot, but not the other way around. The AGP (Accelerated Graphic Port) interface is a now-obsolete interface that was used only for video cards. Very few newer motherboards still support it. I expect it will be history within a few years. The PCI (Peripheral Component Interconnect) interface is also obsolete, but in its day it could be used for literally any kind of expansion card. Because of the staggering number of cards (including some very expensive, highly-specialized ones) that were made for it, some new motherboards still contain one, or at the most two PCI slots. The bottom line is, when choosing a motherboard for your homebuilt computer, double and triple-check to be sure that it has enough of the correct types of slots to accommodate the expansion cards you wish to install.